Attempted Shuttle Launch Attracts Billionaire, Google … and a Mystery Man in a Dog Suit? 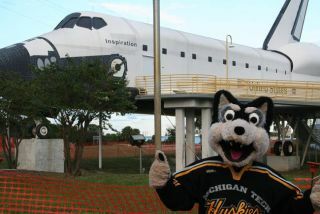 Michigan Tech University mascot Blizzard T. Husky poses with a mockup of a NASA space shuttle while awaiting the final launch of space shuttle Discovery between Nov. 1 and Nov. 5 in 2010. Amongthe estimated thousands of disappointed space fanswho hoped to see space shuttle Discovery's final launch last week weresomenotable VIPs ? a long list that includes an American billionaire, aGoogleco-founder and a mystery college student dressed as a giant dog. NASAtried to launch Discovery on Friday (Nov. 5) afterfour days of delays due to technical glitches and foul weather, butultimately calledoff the space shotuntil Nov. 30 due to a fuel leak andexternal tank crack. Accordingto NASA's latest VIP list, American billionairePaul Allen, Google co-founder Sergey Brin and the Honorable SamuelHinds ? the primeminister of the South American country of Guyana ? were among thedignitariesvisiting NASA's Kennedy Space Center for the shuttle Discovery'slaunch. Likeother shuttlegoers, he went home launch-less. "Hehad a wonderful time anyway," Michigan Techspokeswoman Jennifer Donovan told SPACE.com. "He got to visit theAstronaut Hall of Fame, to sit in a gravity-force simulator, and to doallkinds of other Florida things (beach romp, surf shop visit) that werefirst-times for a Husky from the snowy Upper Peninsula of Michigan." TheMichigan Tech mascot paid most of his own way toFlorida, with help from a private supporter of Michigan Tech athletics,Michigan Tech officials said. As to the person inside the Blizzard suit? thatremains a mystery, they added. "Blizzard'sidentity is a closelyguarded secret, and he wants it to stay that way," Donovansaid. FamedApollo 11 astronaut Buzz Aldrin ? the second manever to walk on the moon ? and actress Nichelle Nichols (who portrayed"Lt. Uhura" on the classic"Star Trek" TV series)also posted updates ontheir Twitter sites stating their plans to try and watch Discovery'slaunchlast week. Nicholswrote that she attended Discovery's first launchattempt on Nov. 1 before heading home to California for the Nov. 2elections.Aldrin wrote that he was in Florida in time for Discovery's Nov. 5launch try. NickoMcBrain, the drummer for the heavy metal band IronMaiden, was also reportedly hoping to see Discovery's space shuttlelaunch. Hewas on NASA's VIP list for the launch around Nov. 4, NASA records show. Thiswas the second NASA center membersof Iron Maidenofficially visited this year. In June, theband received a behind-the-scenes tour of NASA's Johnson Space Centerwithastronaut Michael Massimino. Amongthe other notable VIP guests were Danny Schayes, formercenter for the NBA's Orlando Magic basketball team; retired U.S. AirForce Col.Joseph Kittinger, who set the record for highest parachute jump ?102,800 feet(31,333 meters) ? in 1960; Eric Anderson, chairman and CEO oftheVirginia-based space tourism firm Space Adventures; and former NASAastronaut Scott Altman,who commanded the final mission to theHubble Space Telescope in May 2009 and is now vice president ofstrategicplanning at ASRC Research and Technology Solutions. NASAcurrently hopes to launch the space shuttleDiscovery on Nov. 30 at 4:05 a.m. EST (0905 GMT). The planned 11-dayspacemission will mark the final flight of Discovery and will deliver a newstorageroom and humanoid robot to the International Space Station. NASAis retiring Discovery and its two other orbiters,Atlantis and Endeavour, in 2011 to make way for new space explorationeffortsaimed at sending astronauts to visit an asteroid and, eventually, Mars.Discovery and its sister ships will be retired to museums to bedisplayed forthe public.